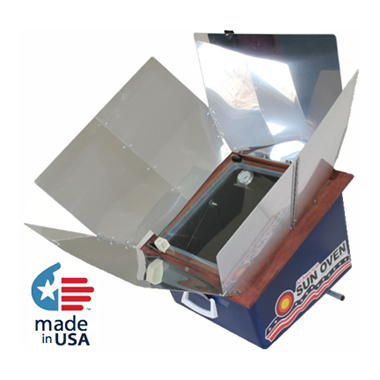 SUN OVEN works and emergency preparedness tips. The pans are sold in sets of two. 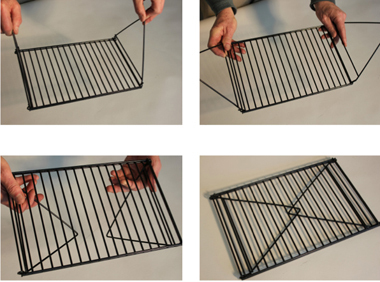 Dimensions are 11" x 7" x 1.5" and fit on the leveling tray inside the SUN OVEN. The pans can be cross stacked to increase the number of cookies or brownies that can be made in each batch. Constructed of heavy-gauge steel that provides an even-heating performance, baking experts prefer for perfectly-browned baked goods. The non-stick coating makes food release and clean-up a breeze! The Sun Oven Steamer and Roasting Pots heat up and cook faster because of their black surface. As the sun's rays enter the oven's dark interior and are converted into longer wave lengths of energy, the heat inside the oven rises, and the light and heat energy is absorbed by both the dark surface, and steel walls of the Pots. Most of this longer-wavelength radiant energy is trapped inside the Pots ensuring more efficient cooking, and a slow, even rise in temperature. This process gives the complex carbohydrates time to break down into simple sugars allowing those incredible, subtle natural flavor to emerge! in The Global Sun Oven®. Designed to be used with the Solar Sun Oven, this is a 4 Quart black ceramic-coated, all steel steamer that comes with an insert that can be removed for regular cooking. This size is perfect for larger meals and it fits perfectly inside the solar oven. 9 inches by 6 inches. Southwestern Recipes for Solar Cooking. A Different Kind of Cookbook! 8 1/2 inches by 11 inches. The Programmable In-Oven Thermometer with Ultra Probe allows you to check the temperature of food and know when it is done without opening the SUN OVEN® door. The thermometer with an easy to read digital screen can be placed on or next to your SUN OVEN®. A probe is inserted into the food, and a high-heat silicone cord connects it to the thermometer. The thermometer is pre-programmed for the desired temperature and beeps when the desired internal temperature of your food is reached. 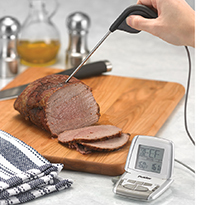 This Programmable Thermometer comes preset with the USDA recommended safe temperatures for beef, veal, lamb, pork and poultry. The preset buttons make it simple to cook to your liking for meat type and “doneness.” One additional open setting can be programmed to your preferred temperature. • 3-MINUTE REST Timer will begin counting down to mark the USDA required rest time for beef, veal, lamb or pork cooked to medium rare (145°F /62°C). • PRE-ALERT Notice will appear on the display and a single beep will sound as the meat approaches the preset temperature. • ALERT Notice will appear on the display and an alarm will sound when the preset temperature is reached. • OVERCOOK Notice will appear on the display and an alarm will sound if the meat exceeds the preset temperature by 10°F. • CUSTOMIZE TO YOUR PREFERENCE Preset temperatures can be customized to cook to your liking for meat type and doneness. • ADDITIONAL OPEN SETTING Can be programed to cook to your desired temperature. Program for the internal temperature your favorite baked goods. (White sandwich loaves 195°F. Brownies, banana bread, muffins, cornbread 190°F. Artisan and whole wheat breads are done when the center, internal temperature reaches 205°F). • COMFORT GRIP HANDLE Sealed probe to prevent moisture damage. • EXTERNAL THIN PROBE TIP For smaller puncture hole when sampling. • HIGH HEAT SILICONE CORD 43 inches long to run from your roaster or baking bag under the door opening of your SUN OVEN. • WIDE TEMPERATURE RANGE 32°F to 392°F (0°C to 200°C). • OPERATES ON AAA BATTERY Battery is included.